The Ghost Fungus is a bioluminescent species from southern Australia. 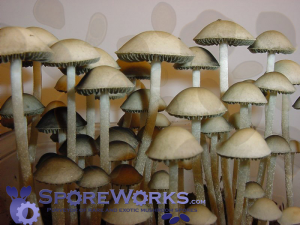 The mushroom's gills generate the brightest illumination with the mycelium not appearing to glow at all. This is unlike Panellus stipticus which has a faintly glowing mycelium as well as glowing mushrooms. The greenish glowing effect is best seen in complete darkness after several minutes of allowing your eyes to adjust. 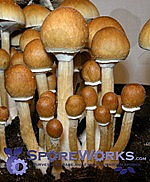 The cultures are sold as a novelty/ornamental only and do not produce edible or internally medicinal mushrooms. 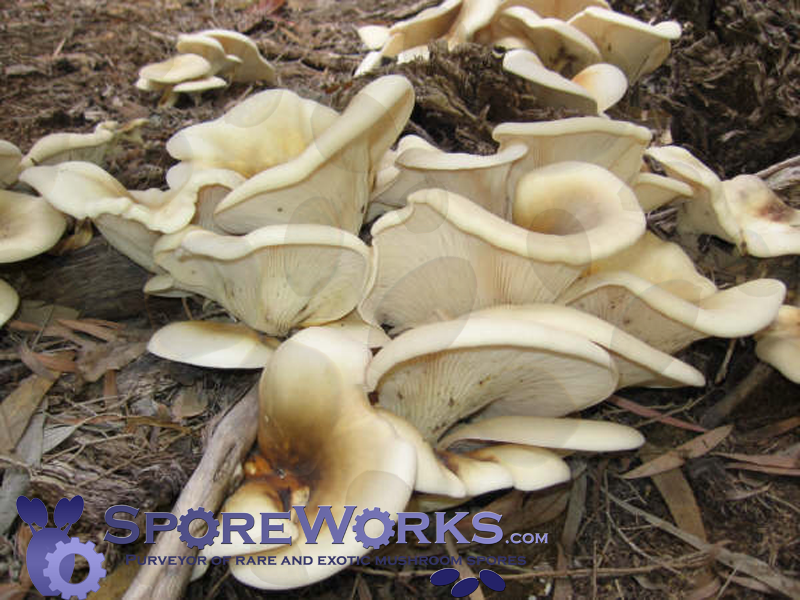 Although it closely resembles an edible oyster mushroom it is instead poisonous causing severe cramps and vomiting as soon as 30 minutes after ingestion. Poisoning symptoms generally last several hours with no long term effects. The oyster-like caps can grow up to 12 inches (30 cm) across and are generally a cream color with orange to gray tints. The mycelium of Omphalotus nidiformis is white but often forms brownish orange patches as it ages. 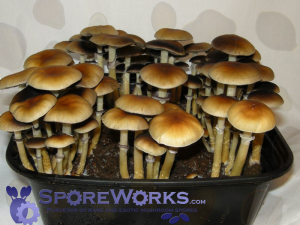 Invitro fruiting on sawdust in quart jars has been observed with mushrooms forming from the darker pigmented areas of the mycelium. This species is still being assessed but it seems reasonable that this species would perform well in logs using plug spawn.